Bath: Atkins; Rokoduguni, Brew, Willison, Cokanasiga; Burns, Green; Catt, Dunn, Thomas; Attwood, Charteris (c); Ellis, Underhill, Faletau. Replacements: Walker, van Rooyen, Perenise, Stooke, Mercer, Cook, Priestland, Wright. Saints: Tuala; Naiyaravoro, Symons, Francis, Collins; Biggar, Reinach; Waller (cc), Hartley (cc), Franks; Ribbans, Lawes; Gibson, Ludlam, Harrison. Replacements: Haywood, van Wyk, Painter, Ratuniyarawa, Eadie, Mitchell, Kellaway, Mallinder. Outs: Saints: Dom Barrow (hamstring), Alex Coles (knee), James Craig (concussion), Paul Hill (shoulder), Rory Hutchinson (knee), Toby Trinder (foot), Ken Pisi (shoulder), Heinrich Brüssow (concussion), James Haskell (ankle), Nafi Tuitavake (neck). Tom's preview: While progress is a clear positive, Saints are under no illusions that points mean prizes. Boss Chris Boyd is trying to get his team to where he wants them as quickly as possible, but he knows they must be securing something of substance at the same time. Saints have earned just four points from their opening three Gallagher Premiership games, with a win against Harlequins sandwiching defeats to Gloucester and Saracens. And while there were some reasons to be cheerful in both of the games they have lost, Saints know that means nothing without adding to their Premiership points total. They bossed possession for long periods during the second half at Gloucester but still didn't go home with anything. And though they were 27-26 up against Saracens last weekend, Saints were eventually outgunned, shipping two late tries that left them without even the consolation of a losing bonus point. Had the TMO not disallowed a late Ehren Painter effort at Gloucester, Saints would have taken a point. And had the black, green and gold not wasted a late attacking position against Saracens, they could have taken two points from that game. But the fact is, they had nothing to show for their considerable efforts in either match. And that means they are under early pressure to pick up points from some tricky trips during the next few weeks. Battles at Bath and Bristol are followed by a clash with local rivals Leicester Tigers at Twickenham. Saints will not only expect to give each of those teams a game - they will expect to win. And if they can, the belief will only grow at the Gardens. When learning new systems and putting together a new-look team, there is nothing like a victory to instil confidence in what you are doing behind the scenes. And how Saints would love to get that victory at Bath. 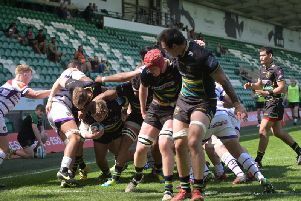 They have had some eventful games there over the years and, with the home side missing a host of key players, they have to feel they can get something at The Rec. But positive thinking means nothing without performance, so it us up to Saints to once again show that they are stepping things up under Boyd. In the most competitive Premiership in recent memory, every point, especially away from home, is crucial. Now it is time for Saints to start capitalising on their new-found confidence as they look to move up that league table.